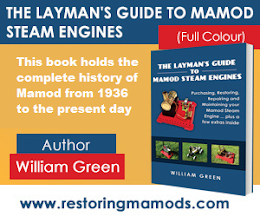 From restoring this Mamod SE3 Griffin and George engine has told me a few things about what to restore. If the paintwork on the engine is in good condition, there is no need to repaint that section. The best paintwork will always be the one by Mamod. Therefore, always try to prevent painting a surface. Well, here are before and after pictures of my engine. I painted none of the surfaces because they didn't need painting. I only cleaned them of dirt. Polished all brass work and flywheel. That's it and what a difference it has made to the engine!